“The girl student” is one of the responses of Yaroshenko, who is always sensitive to popular unrest, to the next change in the usual way of life. Responding to the people’s grief about those arrested and repressed, he writes “Life Everywhere”, so “The girl student” is born out of national turmoil – women are allowed to study, something changes, something ends and it’s scary. 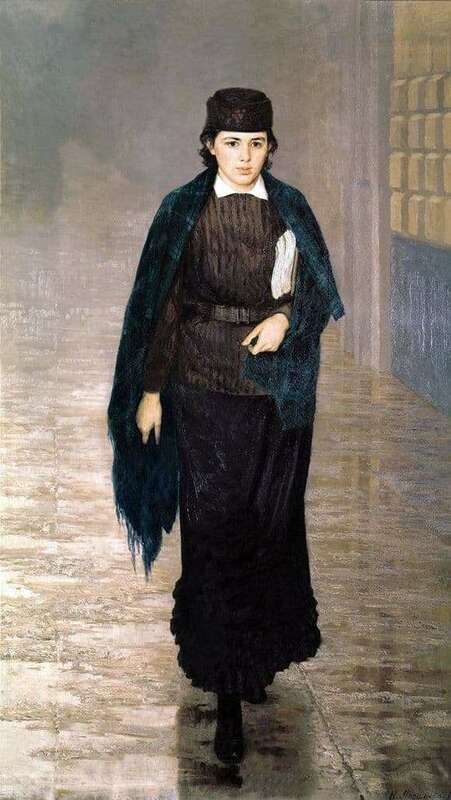 “The girl student” shows a young woman hurrying to study. She is dressed modestly, in a dark dress with a white collar, light on her shoulders, wearing a blue coat, a black cap on her head. Under her arm, a woman holds textbooks – just as all students do in the world, and her hand is bent slightly awkwardly – it is unusual for her, she may even be a little bit creepy to cross her usual ways. She has a wet, shiny pavement under her feet. Apparently, it rained. To the left of it and to the right of the viewer a wall, on the other hand, the picture is not limited by anything, going to apparent infinity. The face of a woman is the most remarkable thing in the picture. She is very young, she has a narrow chin, beautifully arched eyebrows. She looks a little to the side, not at the viewer, and her gaze is scattered and a little confused, as if she is not quite sure what she is doing. This picture was the first image of a student of a Russian woman, and her entire composition was structured to show that there is nothing threatening in this, nothing that should cause alarm. Just a student among other students, a young girl, frightened by her own courage, but overstepping fear for the sake of education. There is nothing superfluous in the picture, small details that matter are traced – the girl’s face, a book, an awkwardly bent arm – and everything else is blurred, slightly floating in a wet autumn haze because it is not important and only sets off the main image and main message.